Hey kids! Long time no see. I took this week off and didn't even realize it until I logged on here and noticed it has been a week since my last post. Whoops. To be fair, Jarrod was out of town for part of the week and I was single-momming it with my four fellas. I've also been gettin' my craft on, trying to wrap up some projects that have been lurking around like sad little abandoned.... things. Linguistic creativity eludes me tonight. Back in August I found this fancy little gem at Goodwill for $5. Not hideous, but definitely not me. I was in it for the frame, baby. I brought it home and thought it would be funny to tell Jarrod I bought it to hang in our bedroom. Much to my surprise, he glanced at it and said "That's awesome!" So either the joke was on me, or I can't really trust him to honestly appraise anything I bring home. Oh well. 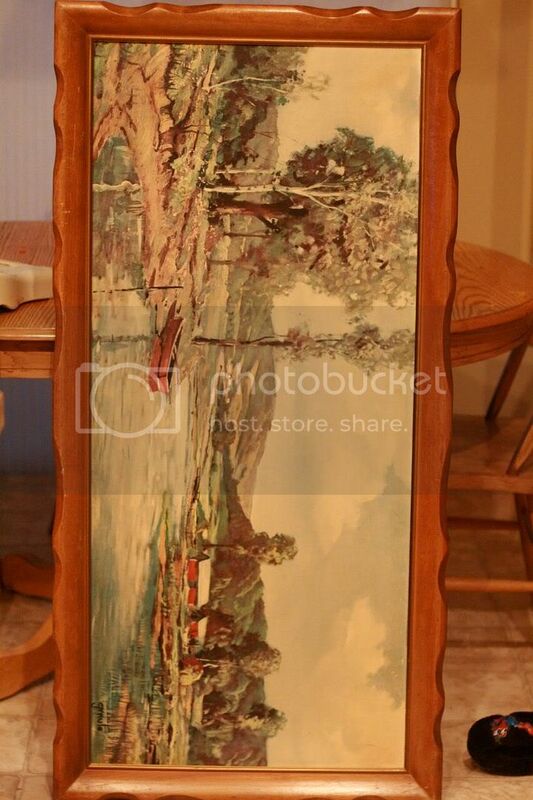 I'd originally thought it could be my chalkboard, but the picture itself was basically painted on cardboard and it was badly warped. So I took it apart, painted the frame black, slapped some new picture hangers on the back and this weekend I finally got it hung. It's taken me six weeks, which in Kira-land is a relatively short amount of time. I went back and forth about what I wanted to hang inside the frame, but finally decided on just making it a little art gallery. A couple of eye hooks and some picture wire took me about five minutes to rig up. And now I have a fun little place to display.... stuff. Stuff such as scrapbook layouts just languishing away in an album. Or maybe some of my kids most recent masterpieces. Haydn's going through a dragon phase. This was a scrapbook layout I did forever ago for a contest at My Kits and Pieces. The pictures are of my grandmother holding my mom as a baby, my mother holding me, and me holding Rowan. It has meaning to me and I've been waiting a few years to find the right way to display it. I haven't scrapped in forever and this post makes me want to dig out my supplies and make a big mess. But instead, I'm going to keep chipping away at the unfinished projects I already have going and post about them. Yay me for finishing something I started! Can be another man's treasure. Thanks Goodwill! If you want to see some more fun ideas for displaying children's artwork, check out this post at I Am Momma, Hear Me Roar. I laughed a little bit because I found it AFTER I wrote this post, and saw that a lot of people had this idea before me, and did it a little better heehee. Se La Vie! I love how it turned out, way to go girlie! I am hoping to make some pumpkin scones today so I came on over to find your recipe and here I find you have been finishing up some projects, yeah!